The Tulare Hill Ecological Preserve (closed to the public except for occasional special events), is 116 acres dedicated to the protection of the Bay checkerspot butterfly, the California Red-legged frog, and other threatened and endangered species. Silicon Valley Land Conservancy Executive Director, Craige Edgerton will lead a gentle hike to the summit of Tulare Hill. Visitors will be rewarded with a spectacular view of the Santa Clara Valley, densely urban to the north and largely rural to the south. Time: 9:30 a.m. – noon and noon – 2:30 p.m. Location: Meet at the Spina Farm Stand, Santa Teresa Blvd. at Bailey Ave., San Jose, CA. Tulare HIll is about 3/4 mile away, with plenty of on-site parking. Fill out this form to reserve a spot on the Tulare Hill Hike! The Santa Clara County Open Space Authority recently acquired this beautiful 350-acre open space preserve in the foothills along the west of the valley. Join a CA Native Plant Society Member and Open Space Authority docent for a fun and educational walk to learn about the flora native to this special place. 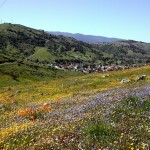 Fill out this form to reserve a spot on the Wildflower Preserve Walk! The Grass Farm has been providing top quality sod lawn to contractors and homeowners for over 40 years. Tour the facility with owner/operator Erin Gil to learn about sod lawn production, installation and maintenance, including low-water use subsurface irrigation. Fill out this form to reserve a spot on the Grass Farm Tour! Time: Spring Classic Tour begins in the morning with the first rides leaving at 8 a.m. Discover Coyote Valley will be sponsoring the rest stop from 8:30 a.m. – 11 a.m. Directions: The tour starts at Specialized Bikes, in Morgan Hill. Discover Coyote Valley’s rest stop will be the first along the route, at 2280 Cochrane Rd, Morgan Hill, California 95037 – Right along the Coyote Creek Parkway! Visit http://www.bicycling.com/springclassic to register or for more information! Coyote Valley Orchids. VALLEY ORCHIDS, INC. has one of the largest selections of top-quality orchids, Asian plants, and fruit trees in the Bay Area. Coyote Valley Nursery. Coyote Valley Nursery provides premium bedding plants to retailers & landscape professionals around the San Francisco Bay Area. Open to wholesale customers. Coyote Creek Parkway. This scenic parkway meanders along Coyote Creek for 15 miles. South of Metcalf Road and through the Coyote Valley, an equestrian trail parallels the paved trail. Public transit is available to Coyote Creek Parkway. Part of the Santa Clara County Park system. Biking in Santa Clara County. The Coyote Valley is a prime destination and throughway for bicyclists, with picturesque two-lanes roads heading into roadways through rolling hills. Special seasonal events offer visitors the chance to explore the area through various activities and attractions. Read about past activities, workshops and events in Coyote Valley on our blog! Cheryl Koehler in Edible Silicon Valley writes about agriculture and conservation in the midst of development occurring in Coyote Valley. Read the article in our blog. The high school students had a productive day with their first hedgrow planting! Read the article in the Morgan Hill Times and learn more about Ann Sobrato High School's partnership with Discover Coyote Valley. Students have had successful hedgerow planting days on April 17 and May 13. Coyote Valley was featured in AgAlert about work being done in Coyote Valley to create a long lasting food belt for the region. Are you a group or organization that might be interested in learning more about farms and agriculture of the Coyote Valley? We are collaborating with many growers and partners in the area to offer customized tours to interested groups. Please contact us to share your ideas and interest! Visitors can enjoy agriculture, recreation, and nature in the Coyote Valley year-round. 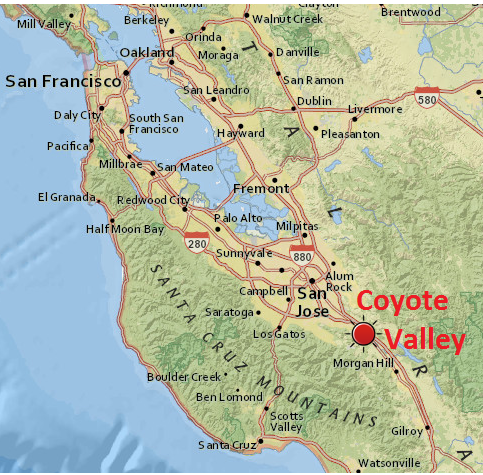 Coyote Valley is located between Morgan Hill and San Jose along the 101, off the Bailey Avenue, Coyote Creek Golf Drive, and Cochrane Road exits. 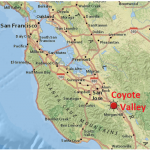 Explore Coyote Valley through our interactive map! We welcome your thoughts and feedback. Let us know what you love about the Coyote Valley, or ways you want to discover the agriculture, nature, and recreation of the area! Check back often for updates on the Coyote Valley and featured events!